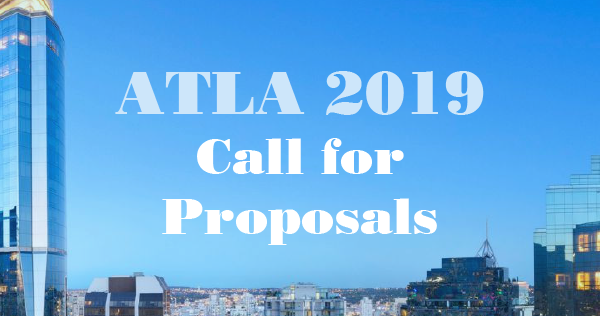 The ATLA Conference Committee invites members and friends to submit proposals for the 2019 ATLA Annual Conference, June 12-15, 2019, in Vancouver, British Columbia, Canada. The deadline for all submissions is Sunday, October 28, 2018. If accepted this proposal will be published as submitted in conference promotions, including the official Conference Program Book. Before submitting, please proofread and do not double space after punctuation. Proposals should include a title that captures the scope of the session; a description of no more than 200 words outlining the significance and focus of the session; and the name(s), e-mail address(es), and institution(s) of the presenter(s). Once you’ve started your proposal, you can visit the same link to edit your submission until the submission deadline. Pre-conference Workshop – Workshop leaders operate in a classroom environment to deliver in-depth practical training on a specific topic. Listen and Learn (50-minute Session) – The session leader(s) introduces a new product or idea, showcases best practices in an area of librarianship, and/or provides suggestions for practical application in attendees’ library settings — time for questions should be included. Panel Presentation (50-minute Session) – A panel presentation is a small group (a moderator and a maximum of three) in which the individual members interact and present differing viewpoints on a topic. The purpose of a panel presentation is to be able to hear a wide-range of perspectives on a given topic and to hear support and reasons for those positions from a group of experts. Conversation Group (50-minute Session) – Presenter(s) gives brief introductory remarks (5-10 minutes) and facilitates a discussion among participants. Paper Presentation (50-minute Session) – Presenters give an executive summary of a paper that includes a research-based component. Presenters are encouraged to post their papers to the conference website one month prior to the conference to allow attendees to review the paper in advance of the presentation. At the conference, the presenter should designate a respondent to facilitate discussion. Lightning Round (10-minute Session) – Have a new idea to share with attendees? Present your idea in ten minutes/10 slides or less. This can also be a narrowly focused data blitz. Poster Session – An informal session in which presenter(s) deliver(s) information that would be useful to the theological librarianship community. We look forward to reviewing your submissions and a great conference in 2019.